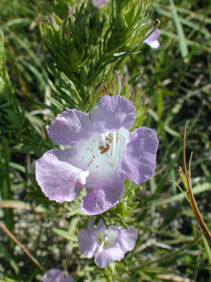 Also Called: Fine-leaf tomanthera, fine-leaf hairy-foxglove. Stems: Erect, very leafy, much-branched, minutely and bristly hairy. Leaves: Opposite, sessile, pinnately cleft into 3-7 rigid, linear to filiform segments, .75 to 1.5 inch long, bristly hairy; tips pointed. Inflorescences: Spikes of flowers in upper leaf axils; bracts leaf-like, progressively reduced above. Flowers: Calyces narrowly funnel-shaped; lobes 5, lanceolate, margins fringed with hairs, tips pointed; corollas 5-lobed, 1 to 1.33 inch long, lavender to pinkish, throat with dark purple spots; lobes broadly rounded; margins fringed with hairs; stamens 4. Fruits: Capsules, egg-shaped, about 1/3 inch long; seeds numerous. Habitat: Dry prairies and bluffs, most abundant on limestone soils. Distribution: Principally in the Flint Hills of Kansas. Comments: Fine-leaf gerardia is water parasitic on the roots of other plants. Related to Rough agalinis .